Striker Connor Wickham is "just happy to be playing" after five goals in three games helped lift Sunderland out of the Premier League relegation zone. The 21-year-old left Ipswich Town for the Stadium of Light in 2011, but before the last six matches, he had only started nine league games for the club in almost three years. Wickham joined Sunderland for £8.1m in 2011, but before the last three games, had scored only once in 37 Premier League appearances. Wickham scored twice and won a penalty in the on Sunday. "There's no point looking back in time - I'm here scoring goals now," he said. "I'm just happy to be playing, I've said all the time that's all I wanted." He also scored in the 2-1 win over Chelsea, and the 2-2 draw with Manchester City this month. Wickham on loan in November and scored eight times in 11 matches. Black Cats head coach Gus Poyet decided to recall the forward again, this time throwing him straight into the starting line-up. 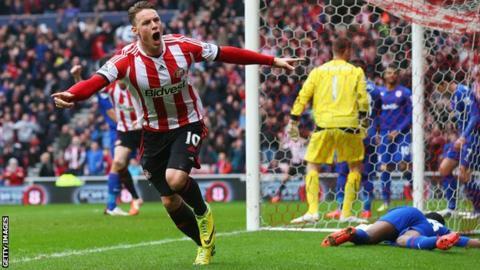 "When I had a run of games at Wednesday I was in this form and scored goals," Wickham told BBC Newcastle. "I just wanted to show the manager I've got what it takes. I'm not going to hold any grudges about not playing in the past." Wins over Chelsea and Cardiff followed a draw with Manchester City, taking Sunderland of the drop zone on goal difference. They also have a game in hand on the sides below them, which they play at home to West Brom on 7 May. "There's lot of hype now we're out of the bottom three," Wickham added. "We're on cloud nine at the moment but need to stay level-headed."